It was my pleasure to cruise on the MS Rotterdam out of its home port. We were headed for Norway, the Land of the Midnight Sun, moose, trolls, fjords, waterfalls, and the North Cape. I knew it would be another wonderful adventure for this Chess Travelor. After getting on board, we found our way to the Explorations Café where most of the chess action would be taking place. My wife, Susan, was looking for the jigsaw puzzles and had a few of her own that she wanted to leave on board. As I walked around the Café, I noticed a lot of chess sets, certainly more than I expected. The pieces and boards were all wood and a good size for a chess player. Of course, I checked to see if they were weighted. Sure enough they had that extra heft that every chess player appreciates. I decided to go to my cabin and return with my Ultimate set. When I originally created this set, one of the main features was the weight. Weighing 3.5 pounds made it ideal for blitz as well as classical games. This Ultimate came from a new mold and the king was slightly taller than before. Therefore, this new feature would get tested out to see if it could take the action I expected. I sat down and began setting up the pieces looking out of the corner of my eye to see if anyone stopped or slowed down on their journey to the coffee stop. Sure enough a gentleman stopped by and asked for a game. I introduced myself and asked where he was from. He remarked that he was Dutch and lived just outside of Rotterdam. As I was to learn, the Dutch were well represented on board as they too wanted to enjoy the sights of Norway. A group of six players gathered on sea days in the afternoon. I found out that we had a Canadian, a few Americans and some Dutchmen, but everything would change for me when I meet Mees. As you can see, Mees Keijzer was a young man confined to a wheelchair. He stopped by the table and began watching a game I was playing with one of the other Dutch passengers. His concentration was very focused, but it was difficult for him to control his body movements. When I concluded my game, I asked his father if his son would like a game. He translated this offer into Dutch and Mees became very animated and excited. I think that meant yes. His father remained at his side as we explored the opening. Mees would point to one of his pieces and his father would indicate that was the piece he wanted to move. It was then mentioned to me that I should point to a square that the piece could possibly move to and Mees would make a small sound. I figured out that one sound meant “yes” and another vocalization meant “no”. I had never played a player with such a disability, but we overcame it with concentration and focus. As we proceeded, I was about to ask Mees’ father a question when I noticed that he had left the area. Now it was just Mees and myself. 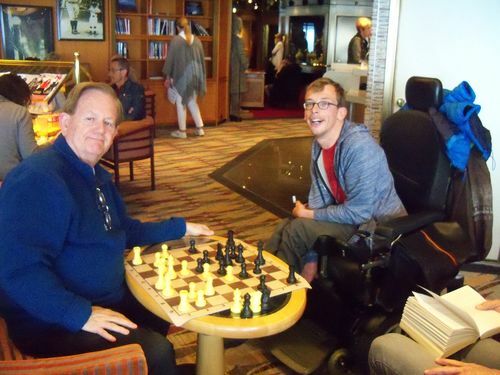 Unfortunately there were few sea days in our cruise, so I did not have a chance to play Mees again. I look forward to returning to Rotterdam and playing Mees on another trip.